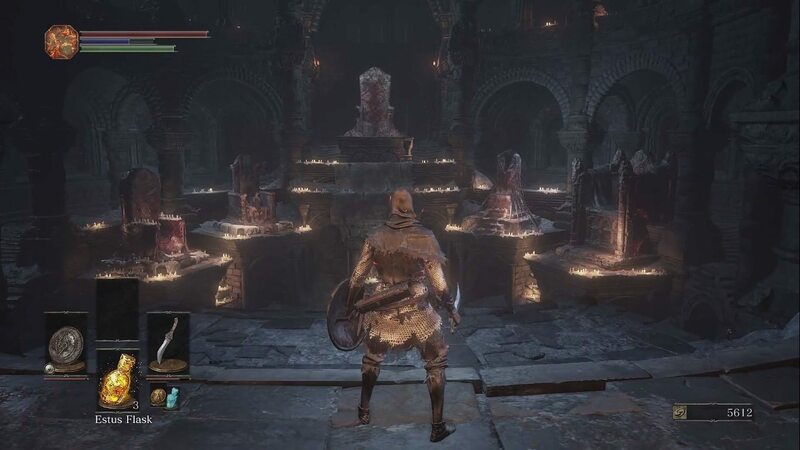 Firelink Shrine is a Location in Dark Souls 3. After defeating the first boss, the unkindled find this safe haven, where they may level up via the Fire Keeper, or interact with other NPCs who have sought the safety of the hub. Click here to go to the Speedrun Walkthrough. Click here for Lore and Speculation on this area. Upon entering Firelink Shrine, before you will be 5 large stone thrones, all vacant but one, where Ludleth of Courland sits. The thrones have inscriptions on their backs, identifying the being who occupied them, such as Holy King Lothric, last of his line. 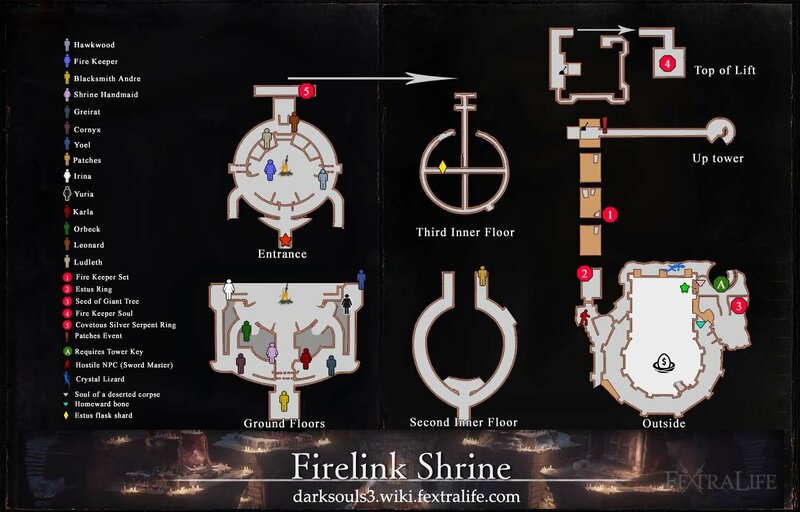 Firelink Shrine itself is quite large, similar to the Nexus in Demon's Souls with staircases up and down where you can explore for items and more tutorial messages. Look out for the rare friendly NPC whom you can recruit and add to the shrine's inhabitants. Merchants, allies, and friends here. Descend the stairs on the right side towards the center area, speaking to Hawkwood seated near the bottom to learn the Collapse Gesture, and then speak with the Fire Keeper at the center. She will make herself available for leveling up and explain the next part of your journey. Embed the Coiled Sword into the fire pit in the center of the room, thereby igniting the Bonfire. From here you may teleport to other locations. 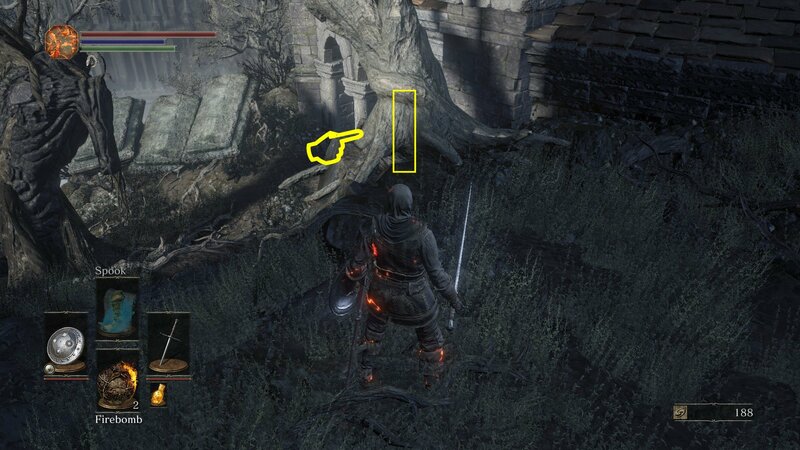 The only one available right now is the High Wall of Lothric, so teleport there if you don't want to explore Firelink. Explore the area of the shrine to meet and interact with other NPCs. On the ground level, you will find the Shrine Handmaid who sells a variety of goods and Blacksmith Andre who performs Upgrades. You may purchase the Tower Key from the Handmaid for 20,000 souls, which will let you access another area here where you can find a Fire Keeper Soul. The Shrine Handmaid also accepts Ashes, which will unlock additional items for sale. Move up the stairs behind the thrones and explore to find Leonhard the Ringfinger, who will give you cracked red eye orbs, an invasion item for multiplayer, as well as progress his quest line. As you progress through the game other NPCs will populate the Shrine, after certain conditions have been met. Look out for additional merchants and quest givers to fill up the shrine. Check with NPCs from time to time, defeating Bosses or discovering areas may trigger extra rewards or new quests. Black Smith Andre can upgrade weapons with titanite, found from foes or treasures. Heading up the stairs right from the entrance, you can step outside, where you will see a petrified Giant Tree. Examining the tree will give the message "a seed of a Giant Tree is yet to fall". Continuing past the tree and up the stairs, you come to a tower and a corpse where you can loot a Soul of a Deserted Corpse 1x. The tower gate is locked and can be unlocked with the Tower Key, which can be purchased for 20000 souls from the Shrine Handmaid. At the top of this tower's spiral stairs, you can cross a crumbling stone bridge here. In the next tower, activate the pressure plate on the lift and take it to the top. Ascend the stairs to the top of the tower where you will find a corpse with a Fire Keeper Soul 1x. Depending on your progression in the game, Patches may show up here and trap you by closing the grated door leading to the bridge. 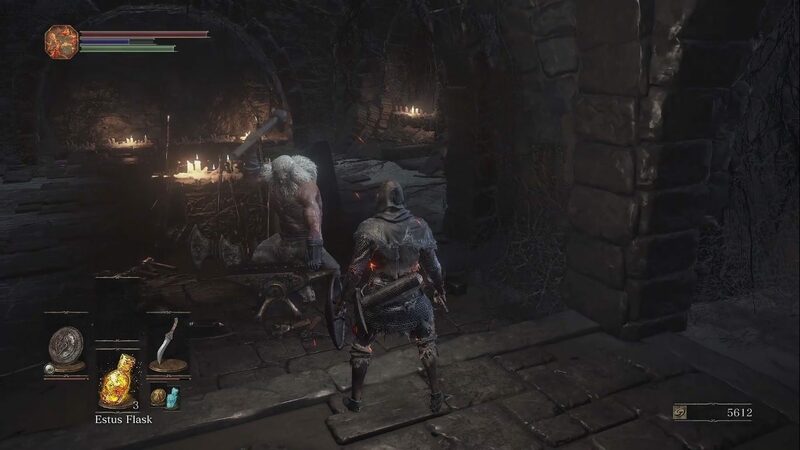 You can jump down from one side of the bridge to a short lip to find a corpse and loot the Fire Keeper Set. From the other side of the bridge, you can drop multiple times to ledges and find the Estus Ring as loot. On this level, you can exit via a grated door to escape his trap. Beware, however, as a katana wielding master awaits you just beyond. Killing him will earn you an Uchigatana and the Master's Set. The tree ahead of you as you look back towards the entrance to Firelink Shrine contains a corpse holding the East-West Shield. Moving forward there are 2 hollows here and a corpse with an Ember 1x. Halfway across the bridge from the tower, you can drop down to a ledge on the left and from there drop down to the roof. In the center of the roof, you can find a nest where you will meet Pickle Pee, Pump-a-Rum the Crow with whom you can trade items. You can also enter back into Firelink from this roof at a higher level and walk across a narrow rafter to loot an Estus Shard 1x. If you proceed down a long rafter you can strike the wall to reveal an Illusory Wall. At the end of the rafter, you can drop down to a lower walkway where a chest lies with the Covetous Silver Serpent Ring. If you drop down from the roof you can find a Crystal Lizard. 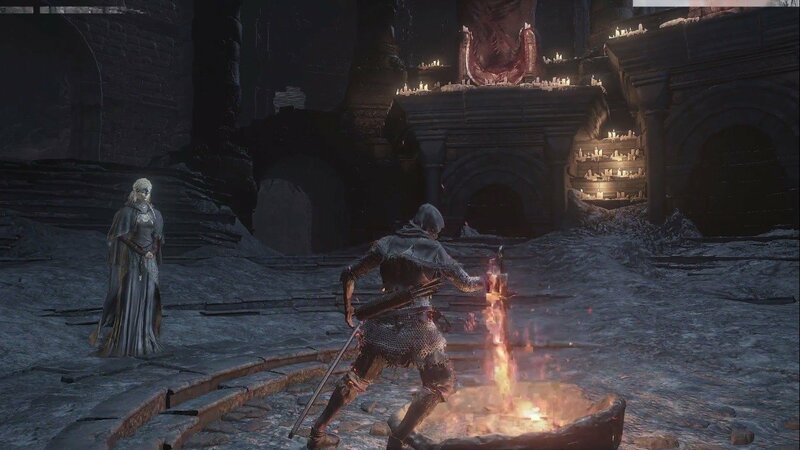 When you are ready to proceed, return to the bonfire and travel to the High Wall of Lothric. You may return to this hub any time to level up, perform Upgrades and more. Videos: Use Links Only. You must be one of our Youtube Partners and follow the guidelines given to add your walkthrough video. The Firelink shrine is a hub, therefore you do not need to do anything specific. Make sure you get the Estus Shard at the top beams sections as depicted on the map, and get the Crystal Lizard for upgrade materials. Everything else is optional. One common technique for defeating Sword Master Saber early in the game involves knocking him off the cliff. If you quit your game and reload, the Uchigatana drop will be available near where he fell. So I fell off the latter a little bit in the tower and then a random voice appeared. It laughed and talked about being more careful but he was a tad too late. It was really weird and random, anyone know about this? whats the egg with money sign? in case you wonder where the shrine is located. It&apos;s behind the Twin Prince boss room. If you get out of the starting chamber of Lothric castle and the direction you look at would be "north" it would mean the shrine would be in the "east". That&apos;s why we cannot see it if we are in the castle. Why I know it&apos;s behind the bossroom? Because we can see the tower from the shrine but no bridge connecting it from the archive. Because the Twin Prince tower is obscuring them. Because we stand in its shadow behind it. Turns out, it doesn&apos;t look like the enemies drop their weapons, or shields. Damn, I thought I could get an early crossbow here, but nooooo. I beat this guy by attacking him, retreating to the shrine then fast travelling to the high wall. When i returned i went back outside and he was gone and the Uchigatana was just sat there ready to pick it up! I want an opinion on the hub place between the souls series, and please be adults and act with honesty and critic, not some bigoted, rose-tinted crap.The only "Souls" games that I have played are Ds2 and Bloodborne before this game, and while I like both hubs of those games, I don&apos;t really like Firelink. In my opinion, while I can go outside, after the annoying fog wall disappearing, I just don&apos;t feel the majesty and wonder of the Hunter&apos;s Dream nor the calm serenity of Majula. Majula is hands down my favorite place to go to because not only am I free to go around wherever, I also have the soothing music being accompanied by the waves of the ocean with the backdrop of a setting sun. In the Hunter&apos;s Dream, while I wasn&apos;t as free to roam as in Majula, I didn&apos;t really mind being there and just looking out from time to time, looking at endless pillars of earth and a sea of clouds; I felt no threat. However, in Dark Souls 3 I feel completely different. I feel like I&apos;m a bird trapped in a cage, suffocated by the dreary stone walls and driven away from enjoying the mountainside by the enemies. I know that they are not difficult but it just seems to me that if you have a hub, why have a multitude of enemies just outside your door? Majula had enemies too, but the skeletons were deep inside the mansion and the pigs didn&apos;t bother you unless you actively went into that small corner in the back.Do you guys feel somewhat like this too or am I a black sheep, just as how Dark Souls 2 is? I have a question that needs an answer...Every time I visit the shrine I keep hearing a growling snarl when my character is standing in a certain spot. Opposite side of the shrine where Hawkwood usually sits. It sounds like a lizard or some type of creature, not sure what exactly because it&apos;s invisible. And standing in that one spot with the music turned off and the sound effects turned up, I can hear it to where I feel like it&apos;s right next to my character.Does anyone know what I&apos;m talking about? Or am I losing what&apos;s left of my sanity...which is void of everything. I can&apos;t find where it is anywhere on the web, people explain the place, what to do when you get there, all pretty useless i can explore myself thank you..How bout to tell me where the ***** place is and how to get there if you wanna write a useful article.Srsly, Before and after what areas please???!?!?!?!?!?!?! From the Shrine entrance (where the fog is), walk up the stairs to the right, out into a courtyard area. Up a small flight of stairs is a tree next to the edge of a roof. Keep attempting to jump (O+L3) [PS4] off the trunk of the tree onto the roof. Try running up at slightly different angles until you get it. Run around the roof until you find a small drop and a door. Walk in here and find the Crows Nest at the top of the shrine. Walk over the top of the Crows Nest, pick up the Estus Shard half way over the other side and turn around. Follow these instructions carefully. When facing the entrance from the rooftop you jumped on to, take a left at the center of the crows nest and walk up to the wall and strike it. The wall will disappear. Walk through this space until you drop down into a small balcony-type area. At the far end of this is a chest containing a ring that increases soul drops by 10%, extremely handy for early farming and it works for bosses, too. Ie. a 2000 soul boss drops 2200.PS. Doing this is technically cheating, but jumping off a tree onto the roof feels more like abusing the geography of the map, it&apos;s not as if you&apos;re hacking or whatever. Normally to access that area costs 20000 souls. So yeah, do what you will but the Ring and Estus Shard are worth it. If you prefer to play DS3 legit and make life hard for yourself then obviously don&apos;t do this. Might be a bup but, died in firelink shrine messing around and could not retrieve my souls afterward. what the hell is it and where? Is there any npc like Yurt or Lautrec that kills other npcs that I need to be worried about? Use the bonfire to travel too the next area. So you&apos;re required to buy the key to progress? sad that I&apos;m required to farm already.